Lisa Doliva, a Womens Sailing Association of Orange County (WSA-OC) member, strives to encourage fellow female boaters as they break into sailing.The Log spoke with Doliva about her commitment to supporting women sailors. What was your first experience with sailing? One of the most memorable moments of my childhood was on a sailboat when I was around 8-years-old and my family was living in Songkla. My dad, the American Consulate, was assigned to Southern Thailand during the ’70s. My dad was quite the Capt. Bligh so there was a lot of screaming and crying. The memory that is burned into my soul was my mother getting so frustrated she jumped overboard and swam to shore. When I moved to California, my love of the ocean continued. I took sailing and scuba lessons and continued to fish off San Diego. When I met my husband, Mark, he owned a Catalina 30, and my love of sailing was reborn. I knew it would not be a good idea for my new husband to give me sailing lessons so I sought out classes. I took lessons from Holly Scott in 2003. I was so impressed with her boating skills and patience in teaching other women. She really instilled in me the importance of knowing everything on the boat. I also was able to get some great learning experiences through Dana Point YC and Cindy Wynne. Why do you enjoy sailing with other women? I felt so much more challenged sailing with other women. Besides the encouraging way women can be, you aren’t pigeon holed in positions. There is not some guy to jump in and dock the boat. One of my most fond memories is doing a women’s race and watching a women strip down to her skives and jump overboard to cut a line that was tangled in her prop. That was my introduction to Susie Campbell. All these women continue to amaze me! I will always be grateful to the women who coached me and held my hand. I now love paying it forward and helping other women feel more comfortable and learning new skills. I really like teaching new sailors or volunteering our boat to WSA-OC and Dana Point YC. Mark encouraged me to skipper an all-women’s crew in the Newport to Ensenada Race in 2013. With the help of some fantastic women sailors and my mentor, Wynne, we took first place in The Carolyn Star division. I co-skippered Izablue with Mark with a mixed crew and took third place in 2014 and second place in 2015 for our class. The best part of the 2015 race was I was able to have my 16-year-old step daughter-to-be on our team. My proudest moment in sailing was standing with her getting our award. She is growing up, knowing that sailing is no longer just a man’s sport. What advice would you give to other women sailors? Join organizations such as WAS-OC or a yacht club like Dana Point YC. There are so many afternoon and evening races going on in the harbor and most owners are willing to support other club members. It is also helpful if you have taken some classes and know basic boating skills. It’s so easy for wives to fall into a crew position on the boat like picking up the mooring, cooking, or jumping off to tie up lines. But, women really need to know how to do everything on the boat. I’m co-producing a fashion show at 7 p.m., Aug. 29 at Dana Point YC. 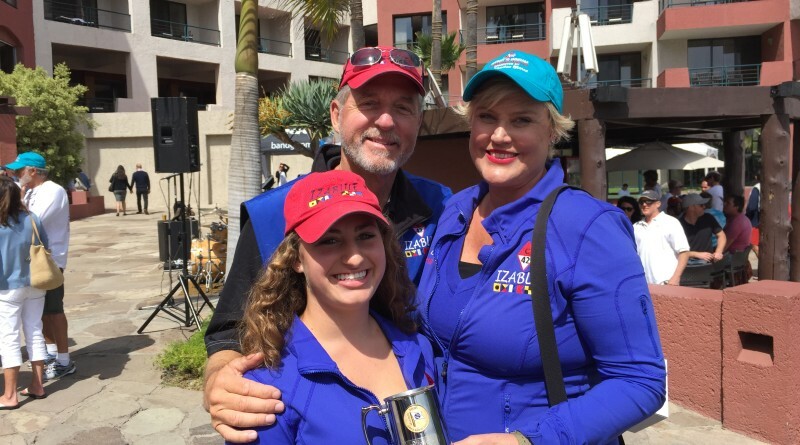 Money raised will benefit the Dana Point Youth Foundation. Just because us ladies like being on the ocean doesn’t mean we don’t like getting gussied up too! The fashion show is part of the 2015 Richard Henry Dana Charity Regatta: tinyurl.com/q9ejjbv. Call 949-496-2900 to purchase tickets.